"Happy Birthday to you! Happy Birthday to you! Happy Birthday dear Dalton! Happy Birthday to you!" 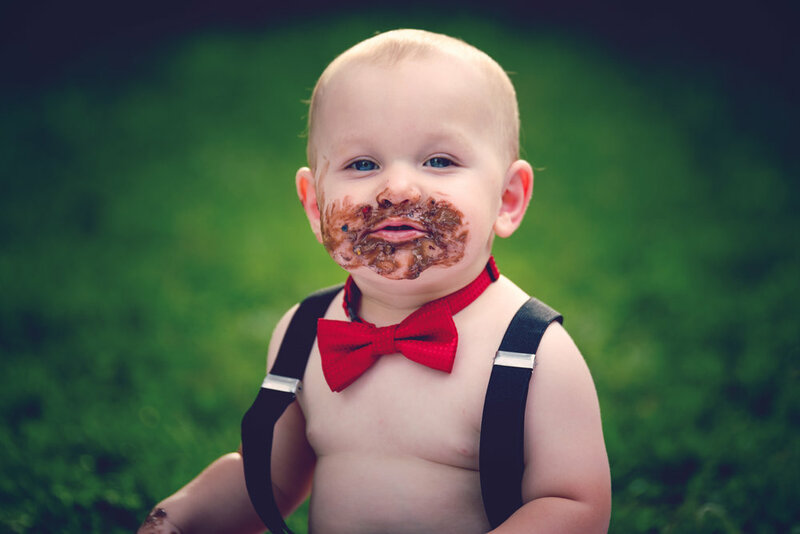 I recently did a smash cake session with Dalton for his first birthday at their home in Mobile, AL. His was super adorable dressed in his bow tie and suspenders and was full of smiles! Dalton absolutely loved his chocolate cake! As soon as we set it in front of him he was digging in and sucking on his hand giggling between handfuls. When he was finished with the cake we brought him over to the driveway and gave him the water hose. He played in the water and sprayed himself off. We were al surprised when he actually started to drink water from the hose! I designed and ordered Elmo and Sesame Street themed invitations for them to send out to family and friends and am currently designing a 1st birthday album. Check back for the images and blog post for the items from this session. I had so much fun shooting Dalton's cake smash and the blog post is perfect for today as I will be shooting a cake smash for a 30th birthday this afternoon. A big thank you to Dalton and his family for choosing me to document this special time in his life. Happy Birthday cutie pie!